NIA CHARLESTOWN NEVIS (December 19, 2014) – Federal Minister of Homeland Security Hon. Patrice Nisbett, described the handing over of a US$350,000 fire tender to the St. Kitts and Nevis Fire and Rescue Services (Nevis Division) as a firm act of collaboration. Nisbett was at the time delivering remarks at the handing over ceremony at the Charlestown Fire Station on December 17, 2014. 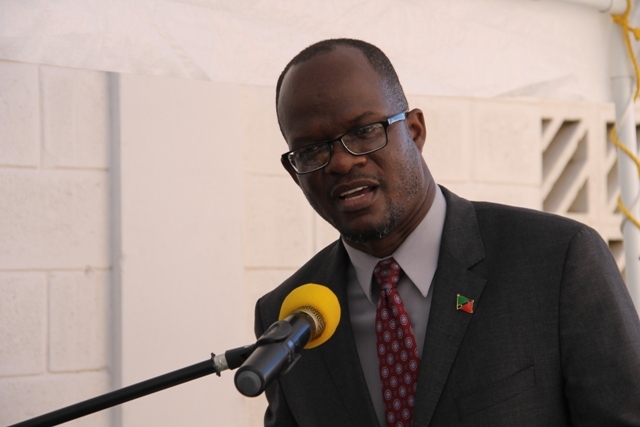 “This ceremony, represents a further tangible demonstration of value, of collaboration in the area of safety and security which was recognised during the conceptualisation of the programme as an indispensable component of any effort, to ensure a stable environment for sustained growth and investments in both Nevis and St. Kitts,” he said. The Homeland Security Minister said the programme he referred to, focused on strengthening the effectiveness of national security governance and special attention was given to the organisational and planning capacity to prevent, detect and solve crimes. Nisbett noted, that the handing over of the new equipment to the Nevis Division funded by the 10th European Development Fund and the Federal Government for use on the island, was the fulfilment of an objective to provide adequate infrastructure and equipment. The Federal Minister also commended the Fire Officers stationed in Nevis. “Personnel deployed here at the Fire and Rescue Services have been patient and must be credited for persevering, as the Federal Government through the Ministry of Homeland Security and this programme, endeavours to address comprehensively, the myriad of challenges, including those associated with the infrastructure and the need for proper updated equipment which are essential to enable their performance of duties. “In my several interactions with the officers deployed here at the Fire and Rescue Services, I have been made aware of a number of issues, all of long standing and which require solutions. I have given a commitment to address the various concerns brought to my attention. The delivery of this tender will not, therefore, only enable the officers to perform their duties more effectively but will give the people of Nevis a certain level of comfort,” he said. According to Nisbett, Officers had received training on how to use the new equipment. “I am pleased to advise that its operators have been appropriately trained, critically important if they are to utilise the tender to perform their various duties. This is laudable and it is also a visible demonstration of our efforts to ensure that capacity is developed. We are not only investing in infrastructure and equipment but most importantly in our human infrastructure and capital. “The men and women deployed here, can be assured that as we build a cadre of committed and professional officers. I am therefore pleased with the progress and remain committed to providing the required leadership necessary to advance the interest of all Nevisians and Kittitians,” he said.